Well here's something a little different, not something you see everyday! 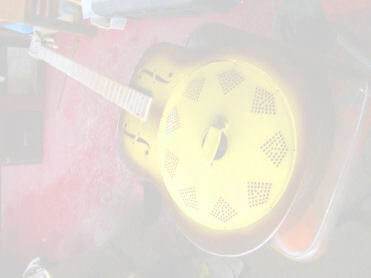 This baby guitar was built by National in the 1930s, so its had a long and industrious life. Industrious being the operative word ! Guessing from its condition a good few tunes had resonated from its steel body. It certainly wasn't in a playable condition when it came to me for a rebuild, but on the good side all the important parts were present and serviceable, and the vital speaker cone was in good condition. Well here it is...... There were quite a few dents in the body and the neck was loose, the fretboard also shows significant wear and was filled with some kind of filler. Here's the inside, speaker cone and cover. The fretboard wear and filler....Ugh. The neck joint dismantled. During its life someone had attempted a repair, evident by the filler and some wood packing pieces. As can be seen the quality of wood used for the braces etc isn't exactly top notch! I know this picture looks a bit over-the-top but I do like to get things right, I'm just turning up a dowel for the neck joint...yes I could have used any dowel but being so old it was an imperial size and everything now is metric..rather than drill the neck heel out I'd rather get things right. see next pic.. Here's what I mean a new body brace being doweled and glued to the neck. Here's the new bit of maple let in to the end of the neck...Also you'll notice that the body hasn't been forgotten either. Pressing in the frets...unlike some people I always like to glue them in, still don't know which is the best just pressed or pressed and glued? Here's the method of repair that I chose to do for the extra holes that had been drilled in the body over the years, this one being for a lead for an extra pickup, I put a piece of steel on the back of the body then soldered it in place. You can also notice other holes filled which were the pickup mounting screws. Here's the near invisible final repair with the solder filed flat, I chose to solder the repairs since I didn't fancy using a plastic filler since there would be a risk of it falling out after time, what with the vibration of the body, unlikely I know but safer this way I thought. Here's a similar repair to the speaker cover. The yellow background to the tobacco burst finish copying the original, I found as near as I could to the original colour shades from the body underneath the fingerboard. The plain chocolate edging applied. At Last things are taking shape, the neck being lined up and fixed in place, with the 'mushroom' braces to the back of the body. Here's the two screws that attach the fingerboard to the body, they sit under two dot markers, these were set screws with threads cut in the body, at some point these had been butchered and replaced with wood screws I replaced them with a couple of 6BA screws and nuts inside the body. One of the screws holding the speaker cover on had a stripped thread in the body...I couldn't find out what thread they were, being American I'd guess UNF but couldn't be sure, 6BA was very close so I re cut it to this and replaced the screw. All finished, ready for a good few more tunes to come out of it!! The owner didn't want it restored as such, so the original bits were left untouched where serviceable.